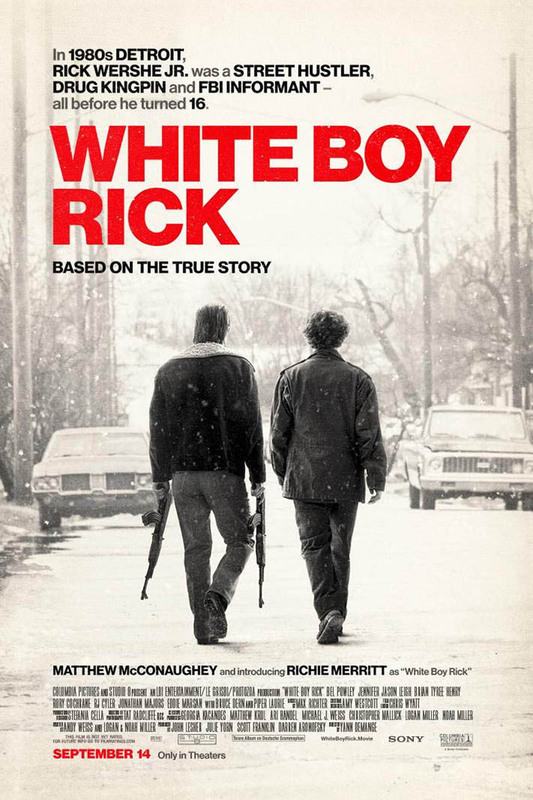 White Boy Rick takes place in a lower-middle class neighbourhood in 1980’s Detroit where urban decay, a budding crime scene and a nearly uncontrollable drug problem set the tone. Products of their environment, the community seemed to do what was necessary to survive in this rough town, and that often meant getting involved in criminal activity. Rick Wershe Sr. (Matthew McConaughey), for example, was an arms dealer. Though arms dealing was technically legal, Rick Sr. would make alterations to the guns and sell them for significant profit, which was not. Rick Wershe Jr. (Richie Merritt) seemed like a good kid. He was a teenager that was going through the motions and staying out of trouble. But once he started selling guns for his Dad, he started getting mixed up with the gang crowd. This spiraled into Rick Jr. becoming one of the most prominent criminals in Detroit. The FBI wanted to get their hands on him – but not to book him; they wanted to work with him and use him to lead them to the kingpins. Despite the exterior of a dysfunctional family dynamic, the Wershes seemed to always look out for one another. Rick Sr. wasn’t a traditional father, in fact some would say he was downright awful at the role, but he loved and cared for his children very much. When Dawn (Bel Powley) was in trouble, Rick Sr. and Ricky found out where she was staying, took her home (albeit against her will) and forced her to get clean. And similarly, when Ricky got into trouble, Rick Sr. and Dawn both did everything they could to help him. It was interesting to see how the family grew closer the more trouble they were faced with. They can be mad at and disagree with each other, but they’ll always be there to pick each other up when they fall. It just goes to show that the stereotypical ‘white picket fence’ family really doesn’t exist. Here’s a glimpse at a real family with real problems. I love that we’re seeing more reality and less stereotype in film. Ricky and Dawn both have fascinating character arcs. Ricky starts out as the good kid and Dawn as the junkie who sleeps around. But as Ricky gets further into the crime world, and as Dawn gets clean, we see them completely switch roles in the family. It’s interesting to see the effect of drugs come to fruition in this film. Ricky starts selling drugs on the street and then goes home to his drug addicted sister. He is indirectly feeding her habit. Having a family member with substance abuse issues is a very touchy situation to navigate. There’s a fine line between helping them and being too overbearing, consequently driving them back to their comfortable habit. There needs to be a desire for them to want to help themselves and, if that desire is not there yet, perhaps one should first try to be there for them emotionally instead of trying to force it upon them. Show them that they are loved and that there is so much more to life than what they’re currently experiencing. That support system is going to help them out in the long run much more than forcing them to straighten up their act. That’s why it was initially shocking for me that Dawn actually gets clean and seemingly stays that way considering how she was physically forced to do so. Although, perhaps, she was happy to have the support of her father and brother again. We get a glimpse of intense foreshadowing when Johnny (Jonathan Majors), one of the gang leaders, was talking to his group about betrayal. The camera moves to Ricky, who is partially standing behind a pole. The pole covers half of Ricky’s face, and he looks very nervous. The two-faced foreboding in this scene was palpable. Ricky knew he was going against his friends and that it was a serious problem given the physical danger that could come his way if he was found to be a snitch. The lead role of Rick Wershe Jr. was given to first time actor, Richie Merritt, during a nationwide casting search. Apparently it took them quite a while to find the right fit but it was worth the wait! Not only does Merritt embody White Boy Rick, but his acting skills were impressive given his lack of experience. I’m very interested to see if he continues with acting and if so, what he tackles next. You also couldn’t get much better than Matthew McConaughey as Rick Wershe Sr. He is a genius. Merritt and McConaughey are an absolutely phenomenal duo. 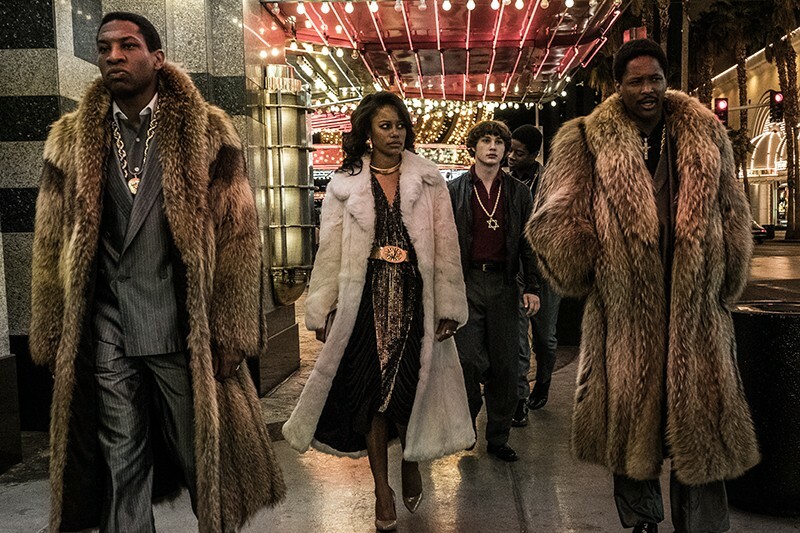 As a film, White Boy Rick is just down right fantastic, in my opinion. I would encourage you to run to the theatre to catch it. It’s a heavy movie, and there are a few shocking scenes, but it’s an important story to be told. The real Rick Wershe Jr. was sent to prison for life at the age of 17 for drug crimes in 1988. He is still behind bars. Currently 49 years old, he is allegedly scheduled to be released from prison in 2020.